Jack Palance ... Lt. Joe Costa - Fox Co. Buddy Ebsen ... Sfc. Tolliver - Fox Co.
Q: Does anybody knows what kind of tanks german army use in the movie? One of Robert Aldrich's classic war movies explores pyschological pressure and just how war effects men mentally. Even the "good guys" have their bad sides, and the bad guys are so screwed up you either sympathize with them or hate them. 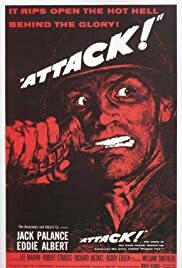 During the fall of 1944, Captain Cooney (Eddie Albert) commands a weary infantry company. Lt. Costa (a young Jack Palance) realizes that Cooney is unfit for command when he freezes in combat. Costa and close friend Lt. Woodruff (Bill Smithers) try to inform their superior, Colonel Bartlett (Lee Marvin sporting a southern drawl) of Cooney's incompetence; instead, White wants to stay out of the way and hopes for the best. He owes Cooney a chance to become a hero so he can look good back home. Well, as you might have expected, Cooney again freezes in combat, this time costing the lives of several of Costa's men - and Costa goes looking for vengeance in an awesome climactic sequence. The supporting cast is dotted with familiar faces, including Robert Strass from STALAG 17 as an oafish, emotional dogface; the late Buddy Ebsen (BETWEEN HEAVEN AND HELL) as Costa's loyal platoon sergeant; and Richard Jaeckel (who's appeared in at least a dozen war flicks) as another young soldier. Kudos to Bill Smithers, who does a fantastic job in an early role as Costa's rational friend. His final scene will leave you stunned and reeling. The movie features a number of memorable scenes which combine physical action, superb dialog and emotion perfectly. One scene in which a mortally wounded Jack Palance prays that God will let him live long enough to kill Cooney is gut-wrenching. Interestingly, both Cooney and Costa have lost their grip on sanity. It's clear from the beginning that Cooney is a whackjob, and Costa is perfectly sane. But he becomes madly (no pun intended) obsessed with killing Cooney, that he forgets everything else - including his own men which is fighting to save. Instead of focusing on thousands of troops and big explosions, Aldrich delivers enough punch in his small-scale story to knock you down. Interiors and exteriors are beautifully shot, confining the action within small spaces to deliver maximum intensity and efficiency. ATTACK! is an honest film - yes, this type of thing did happen; read or see BAND OF BROTHERS (particularly episode #7) to witness a brutally accurate account of flawed leadership resulting in disaster. I give an 11/10.